Help Us Continue Our PRIME Mission! All proceeds benefit the James Madison Belle Grove Foundation. The James Madison Belle Grove Foundation is a non-profit organization (509 a2 – historic site). All donation will receive a letter of acknowledgement. Please consult your tax professional when claiming your tax deductions. Now you can shop and support the James Madison Belle Grove Foundation two ways! 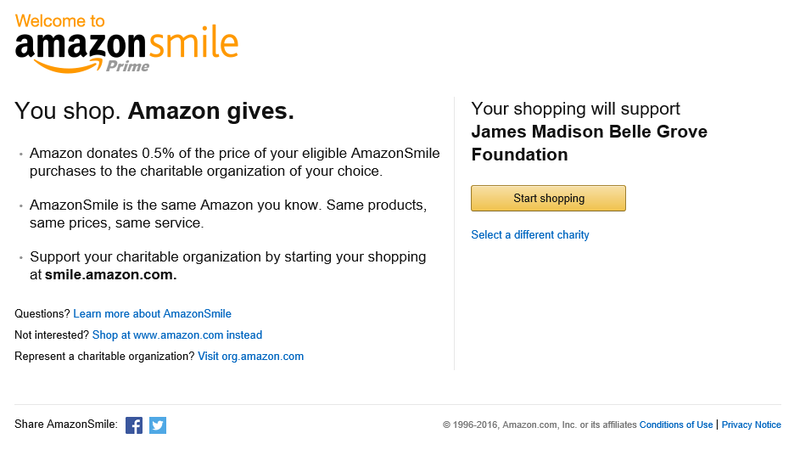 Select the James Madison Belle Grove Foundation as your charity through Amazon Smiles! Click Here To Select the James Madison Belle Grove Foundation as your Charity! Shop on Amazon.com by going through our links first! Click on any product link below and shop as normal. By clicking our link, Amazon will donate a percentage of the sale to Belle Grove Plantation and at no additional cost to you! But you have to click through our link first each time you visit Amazon.com to shop for the donation to come to Belle Grove Plantation! and Help Us Continue Our PRIME Mission! You are cordially invited to attend our Downton Abbey Casino Night on Saturday, November 12, 2015 from 6pm to 11pm. SPECIAL RAFFLE BEFORE THE EVENT! Thinking of attending our Downton Abbey Casino Night? Why not make it an evening to remember! We will be conducting a very special raffle before the event that will see one lucky couple receive a Grand Prize overnight stay in the Turner Suite and $500 in Belle Grove Bucks to “gamble” with! Second Place Prize will be $400 in Belle Grove Bucks and Third Prize will be $300 in Belle Grove Bucks! All proceeds will go to the James Madison Belle Grove Foundation to help continue their PRIME Mission of preservation, restoration, improvements, maintenance and educating the general public about Belle Grove and its Amazing American History! Purchase your raffle ticket online for just $5 each. We will send your raffle ticket numbers for your records. The James Madison Belle Grove Foundation is hosting our Annual New Year’s Eve charity event – The James Madison Belle Grove Foundation Casino Masquerade Ball. Belle Grove Plantation’s Masquerade Ball is famous for its intriguing party guests and excitement during the evening as everybody will show off their most fabulous masquerade masks and New Year’s party attire! With the donation jars, bake sale, online and mailed donations and the donations received during the race, the James Madison Belle Grove Foundation will be receiving $1,663.60. Last year’s total was $662. We celebrate the pleasures of the palate at the Spirits Festival at Belle Grove Plantation presented by the James Madison Belle Grove Foundation. Combining exclusive wines, craft beers and distilled spirits while featuring the talents of local and regional artists, live bands and culinary delights, made the Spirits Festival at Belle Grove Plantation a perfect blend of fall time on the banks of the Rappahannock River. We also kicked off our Ghost Tours at Belle Grove Plantation with tours of our historic mansion with special “spirit” guides (Coastal Virginia Paranormal) as they moved our guests through the mansion with stories of the haunts of Belle Grove Plantation. Photographic evidence, audio voices and more awaited those who brave this tour! After our Spirit Festival Event and Ghost Tours and with the added funds from our “Get Into the Spirit” Online Auction, the James Madison Belle Grove Foundation will receive $5,499.95! This was the first time for this event and we plan for this to become an annual event. We would like to thank everyone who have attended our James Madison Belle Grove Foundation events and have donated to our foundation. It is through your support that future generations will have the opportunity to know Belle Grove and learn about our amazing American History.